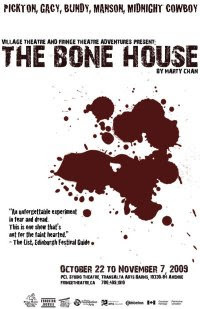 "A horror show that rivals, maybe even surpasses, The Blair Witch Project for skin crawling creepiness and terror," bragged The Globe and Mail about Edmonton writer Marty Chan's "The Bone House," playing at the TransAlta Arts Barns' PCL Studio Theatre (780-409-1910) from October 22nd to November 7th. The theatrical thriller is set around "mind hunter" Eugene Crowley (and his assistant Jacob), who tells the story of the "Midnight Cowboy," an infamous serial killer who prefers an audience for his murders. The subject of these types of murderers (ie. Bundy, Manson, Pickton) becoming "celebrities" in our society arises, and the show also takes a look inside the mind of a killer. "Will the audience help Eugene to find the "Midnight Cowboy" or will they be a part of his next performance?" There's a simple way to find out, and that's to shell out $19.95/ $14.70 for students & seniors ($10 Tuesdays/ "Pay What You Can Mondays") (+ GST and $1 facility fee). The Edinburgh Film Festival top pick will run for 21 presentations during its 17-day run, starting at 8PM each night (excluding Sundays), in addition to multiple performances on Fridays and Saturdays at 10PM. You can also check out "The Bone House's" Facebook page for more information.